I love to tell fortunes. My darling Jenna —my niece— doesn't think I really can tell fortunes. She coddles me. But I can tell them. Sometimes. Most times. When I see into the future, and I know what's going to happen to people, it throws me for a loop. Should I tell them the truth? Should I steer them in a direction that might alter that future? A friend of mine is curious about her future. She runs the Winsome Witches fund-raising group, to which I belong. She is the High Priestess. She's a beloved therapist. And yet she has come to me for advice. I've talked to her. I've consoled her. I've offered her a tarot card reading. She, like Jenna, pooh-poohs all of it. She wants the truth. The physical facts. Gemstones. Earthy potions. Concoctions made with local beverages. I'm not sure what to do. What is she sensing? What truth from Crystal Cove is she picking up? We have so much to tell. We have history up the wazoo (forgive me). Perhaps I can attribute her demands to the fact that Halloween is fast approaching. The stores in town are decorating. The Cookbook Nook has a delightful display of pumpkins and more. Our friend Bingo has decorated her antique shop with a dark noir display of a woman running from a gabled house to a cemetery. So eerie and yet so dramatically cool! What can I tell my friend? To relax? Hard to do in this season. What do you do? Do you adore Halloween? Are you already thinking about your costume? Or are you contemplating dire deeds and possibly....murder? 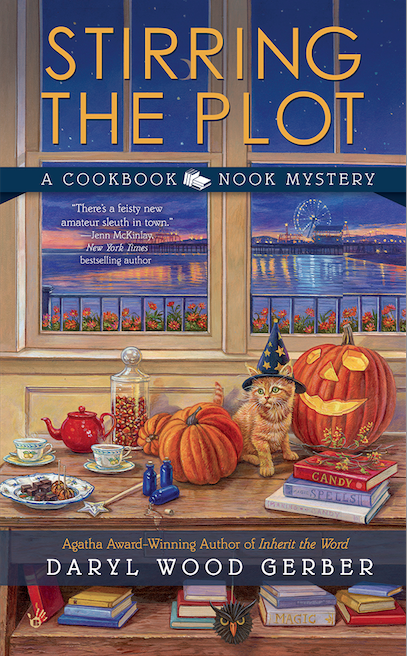 Do you want to win a copy of a Cookbook Nook Mystery? 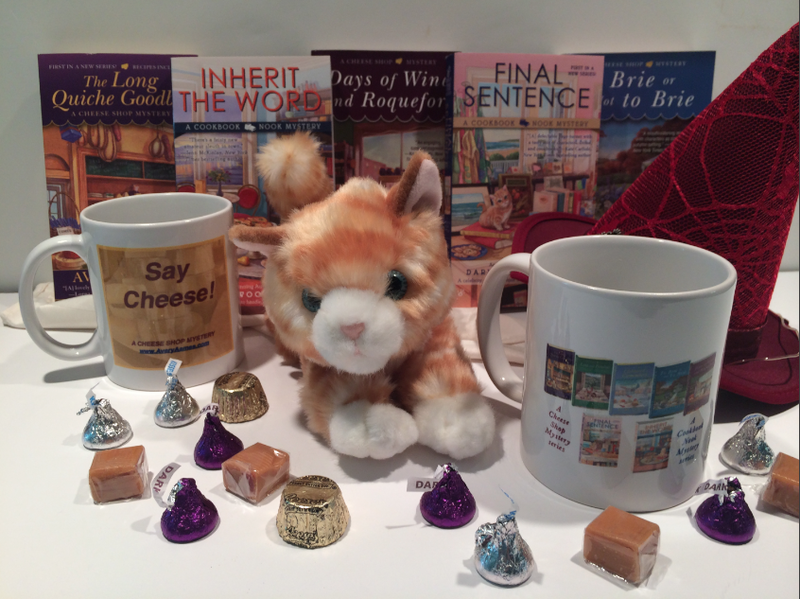 The first two are up for grabs...your choice: FINAL SENTENCE and INHERT THE WORD. Your choice! Leave a comment!!! Note: I might not respond...I'm on the road, but I will respond by end of day!!! For STIRRING THE PLOT, which comes out September 30th, I'm going to be doing a number of giveaways on Facebook, Fresh Fiction, Goodreads, and my newsletter. Make sure you're signed up for ALL! I would love to win a copy of the first book in the series. I live this series and can't wait to read the Halloween story. Love Halloween and I really enjoy reading Halloween Cozies during the season. I love these books! I'm looking forward to Stirring the Pot! I would love to have a copy of Inherit the Word. Love the Cheese Shop Mysteries! Not contemplating any dire deeds but definitely love Halloween. The atmosphere, the old movies . . . and when my children were little before Trick-or-Treating we would have our special Halloween dinner - all orange food (pretty simple for kids, orange Kool-Aid, orange Jell-o, beans and franks). They loved it, and now my granddaughter makes our special meal for her little ones. Pretty funny that what started out as a way to get some food into them turned into a family tradition. Final Sentence. I love Halloween. On Facebook, someone posted cutting holes that look like eyes into empty toilet paper rolls. Light up a glow stick and stick them into bushes so they look like creepy glowing eyes. Can't wait to try it. How clever! What a great idea. Take a photo and post it, will you? Love Halloween, especially roasted pumpkin seeds. love halloween! 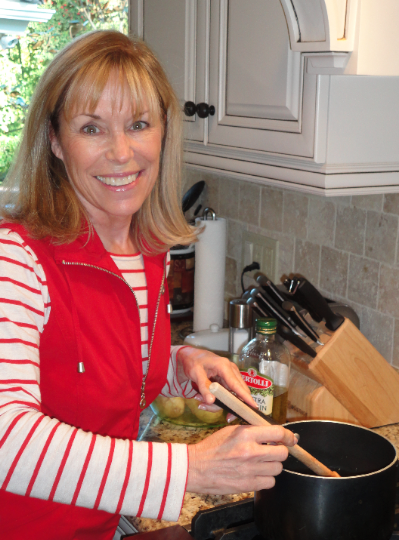 i would also love to read your cookbook nook books! I'm not at work, so I'm not contemplating murder...yet. I am looking forward to the autumn. I liked Halloween as a child. As an adult, not so much but I do love the fall season and most foods made with pumpkin. I have read a couple of your books and was not disappointed. Looking forward to this fun series. Thanks for the chance to win a book. I'd love to have a copy of "Final Sentence". Love Halloween...sounds like a fun read, thank you for the chance to win. I love the decorations, too. My younger brother is the Halloween fan in the family. He loves to decorate his house and have a party. I love the decorations for Halloween but I was never much for the Trick or Treating. These books are on my TBR list once summer slows down a little - they look like a great read! Thanks, Susie!! Summer, fast and slow, hard to find all the time you need, right? How wonderful! Thanks for the giveaway! I'd love Inherit the Word! I too like the decorations for Halloween. Decorations can be so fun and spooky! Carnivals, right. Love a Halloween carnival. This looks great! Would love Final Sentence...always best to start at the beginning! Love your email "misstree" - very cute. That's great! Happy early birthday. I would love to read Inherit the Word. I read Final Sentence and loved it. How lovely to see all of you responding today. Thank you for chiming in. Ooo, Daryl, Halloween fun and mayhem! Perfect. Wow, what a menu! Love it. Marylou, You won! Contact me at daryl at darylwoodgerber dot com to claim your prize. I think I might enjoy this paranormal. It sounds like it is very good. Hey Aunt Vera! Thanks for the chance for me to win Inherit the Word. #1 in your series is a good one! Ya'll have a beautiful week now! Sheesh! Forgot to add...Halloween isn't a big thing in our retirement community which is a bummer...I really do love to greet the trick-or-treaters at the door. Gone are the days of homemade candies, caramel apples and popcorn balls which is a shame...those who ruined that for our children and grandchildren hopefully were prosecuted to the full extent of the law. Ah, Sandy, I know what you mean. There are still trick or treaters in our neighborhood, but every parent is much more aware and they pay attention to the doors, lights, people inside the houses. I love that malls and schools and other public opportunities still exist so kiddies can dress up. Halloween is fun for me because I spend it with the kiddos. My book club read the first book after going to the Salt and Pepper bookstore and loved it! I haven't started the second yet, but would love a copy! Ah, Salt and Pepper. It closed, you know? A heartbreak for me and many of my author pals! I would love to win Final Sentence. I miss Halloween now that I live in the sticks and the kids don't come here. Yes, I live on a steep hill, so no kiddies here, either, but I get out to see them. Remember to add your email, just in case. My favorite part of Halloween is seeing all the kids dressed up trick or treating...they are just too cute! I'd love to win Inherit the Word...really enjoyed the 1st book in the series and the new Halloween one looks like a fun read too! My email is mkdmom@optonline.net. Thanks for the giveaway! Love Halloween. Love you cozy mystery. 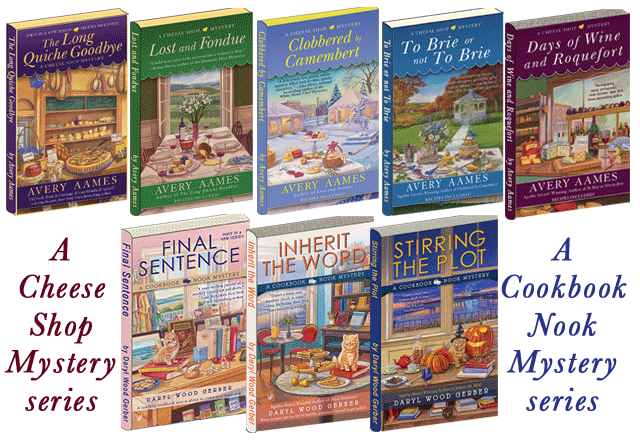 I've never read any of the books in this series, but I have read all of the Cheese Shop Mystery books! If I win I would like Final Sentence because like I said I have never read this series. I was supposed to be born on halloween! But my mom didn't want that, so they changed my due date. Thanks for the giveaway! Would love either book and I love Halloween. Love to see the costumes that the little kids wear. Don't enter me in the giveaway, but I have read and loved the first two in the series. I love how the internet totally embraces Halloween. So much fun. Love all the books that come out too. Inherit the Word. I adore seeing children happy at Halloween. That is the best part. Love Halloween and your books. Hi, all! Marylou won today's giveaway. Thanks for joining in the fun. Look at my Facebook page and sign up for my newsletter to be included in future contests. 2 on Faceboook in August and September and a big bash via my newsletter at the end of September to celebrate the launch of Stirring the Plot! Would love to win. I love Halloween cozies. I love everything pumpkin and your books. I adore Halloween: children dress up, cool decorations, treats, etc. I would love to win either book, please. I adore halloween! I especially love playing with a creepy theme with my crafts, so many fun creative ideas to run with!